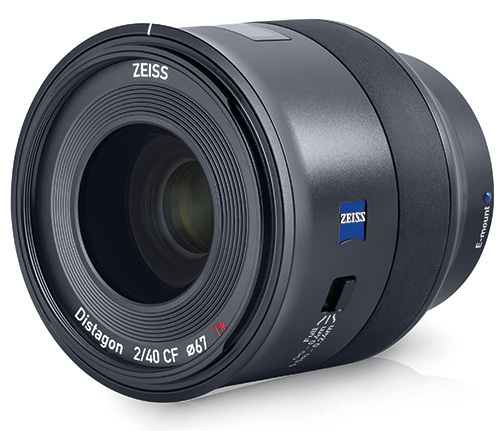 Zeiss has officially announced the Zeiss Batis 40mm F2 Close Focus lens, bringing the total Batis lineup for Sony full-frame E-mount to five, with focal ranges from 18mm to 135mm. Like with all Batis lenses, the 40mm F2 CF is weather-sealed and features autofocus with an OLED display that shows the focus distance. The CF in the name stands for close-focus and the lens can focus down to a distance of 24cm (9.4in) with a maximum reproduction ratio of 1:3.3. The lens is constructed of 9 elements in 8 groups, with three aspheric elements (one of which uses ‘special glass’), and four elements made of special glass with anomalous partial dispersion. The lens measures 93mm long and 91mm in diameter, and weighs in at 361g. It accepts 67mm filters, and comes supplied with a bowl-shaped lens hood. It’s due to go on sale in November priced at £1129.99 including VAT, or €1.299 (incl. German VAT) or 1.299 US$ (excl. local taxes). Further details and sample images can be found on the Zeiss website here.